Come to the L.E.A.D. Center for Diversity & Cultural Enrichment for a fun afternoon of film, dialogue, and food! 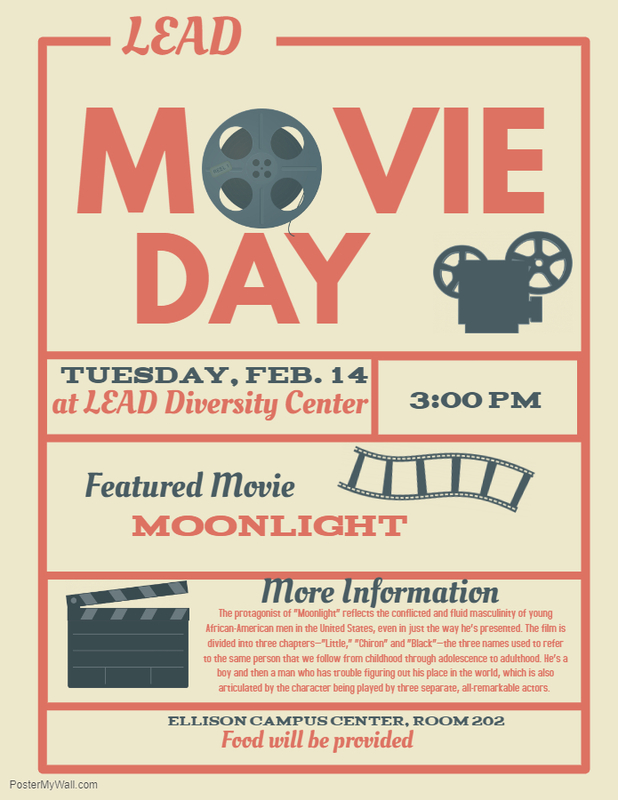 Come see the Oscar-winning film, Moonlight, with your friends from the L.E.A.D. office. Food will be provided and stay after the film for a discussion about the film's themes. The protagonist of “Moonlight” reflects the conflicted and fluid masculinity of young African-American men in the United States, even in just the way he’s presented. The film is divided into three chapters—“Little,” “Chiron” and “Black”—the three names used to refer to the same person that we follow from childhood through adolescence to adulthood. He’s a boy and then a man who has trouble figuring out his place in the world, which is also articulated by the character being played by three separate, remarkable actors.